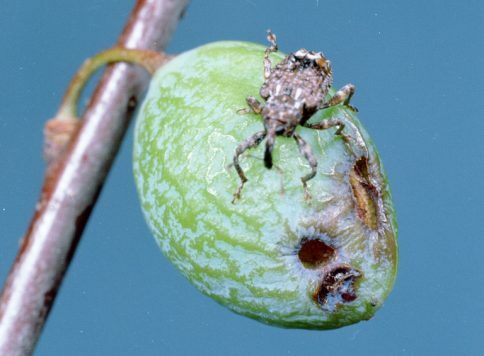 The Plum Curculio prefers plums but also infest peaches, apples, pears, cherries, quince, blueberries and other fruits. Non-crop hosts include wild plum, hawthorn, and crabapple. 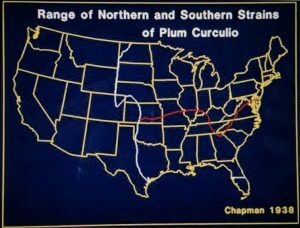 Two geographical strains have been identified – northern and southern (see above). Northern strain has to over-winter before sexual maturity and hence are limited to one generation/year. Southern strain does not require over-wintering to mate, and so is capable of multiple generations/year. Aggregation pheromone (grandisoic acid) released by male when adequate host material is found for reproduction and/or feeding. Pheromone attracts both male and female adults. Prefers warm, moist, shady environment. Will be more active on warm, damp, cloudy days and in trees with dense limbs and leaves. Most active during nighttime hours. 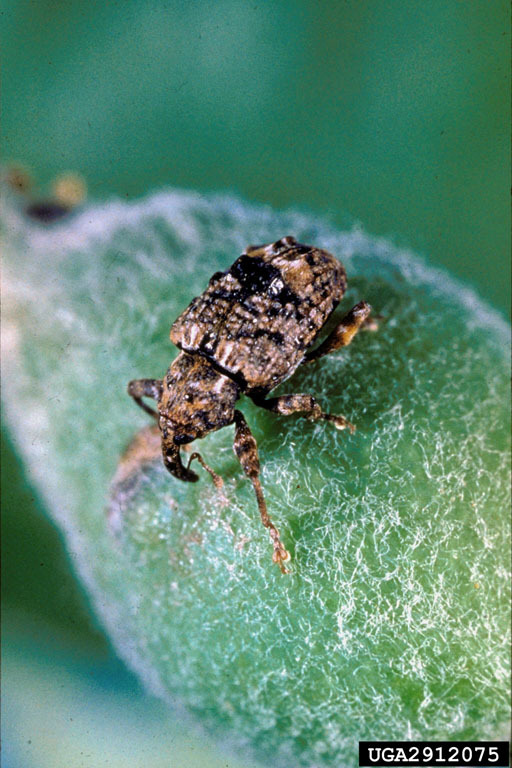 High winds and low humidity cause adults to burrow into soil in search of moisture. 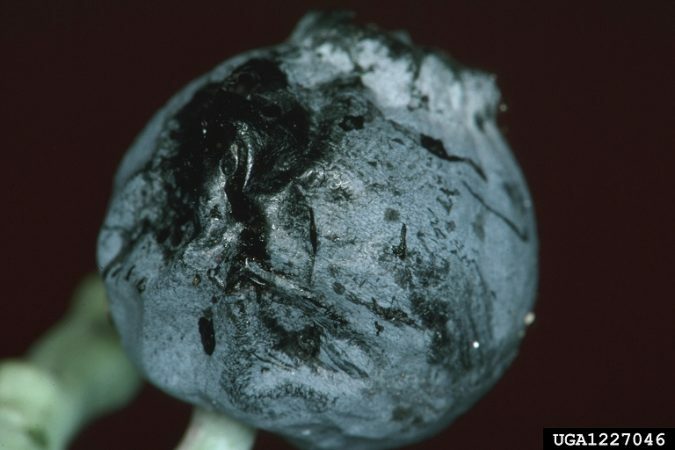 In the spring and late fall, adult feeding behavior leads to puncture wounds in blooms and fruit which stops or inhibits normal fruit development and increases vulnerability to various bacterial and fungal infections. 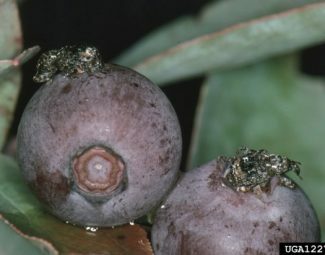 Female punctures fruit to enable egg to be laid inside. Resulting scar leaves a characteristic bowl shaped wound, although often hard to see in peaches due to fuzz. 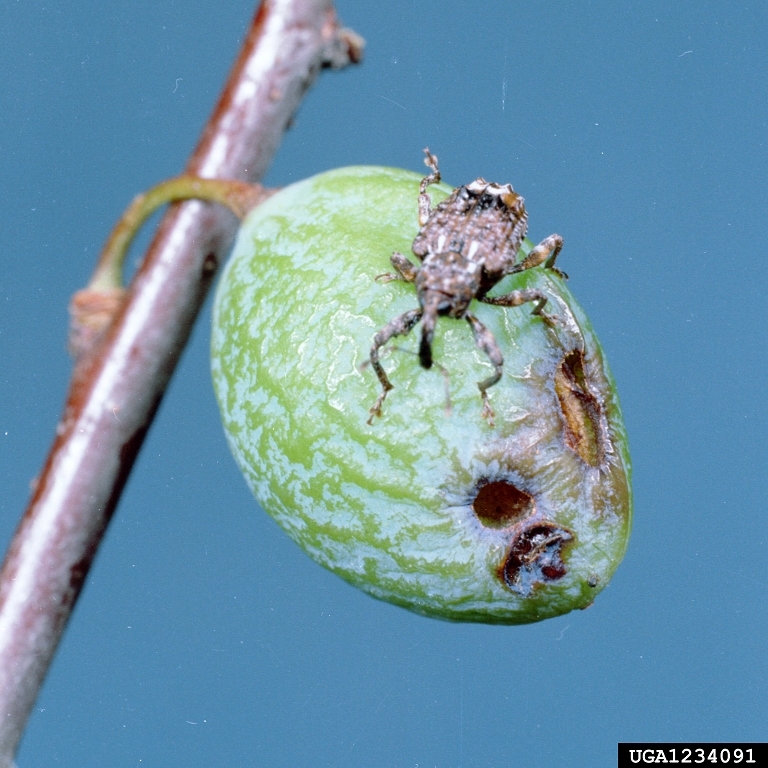 Larval stage feeds within protection of fruit. 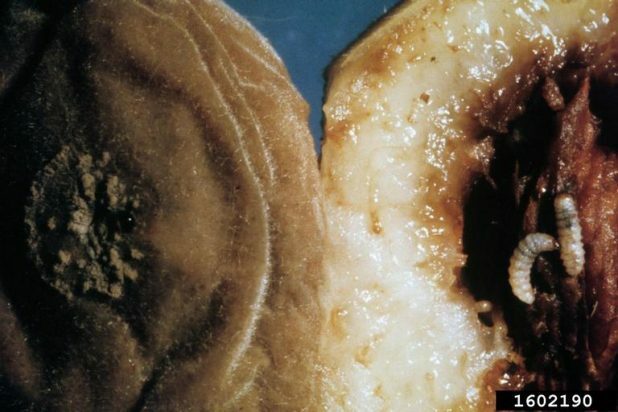 Leads to destruction of fruit quality and often leads to fruit abscission. 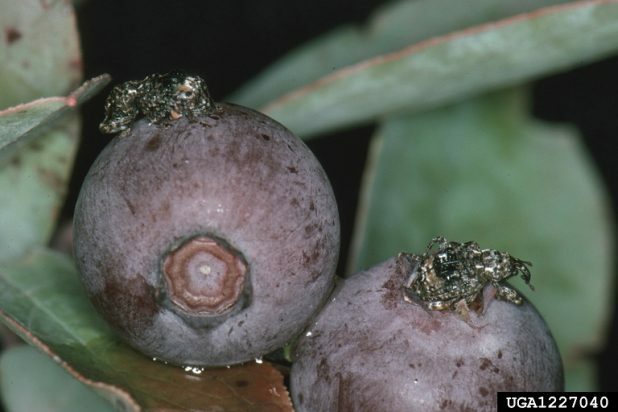 In early spring emerging adults often crawl from ground up tree trunk to reach fruit and flowers. During warmer weather, adults have a tendency to fly directly to canopy and fruits, rather than crawling up the tree trunk. 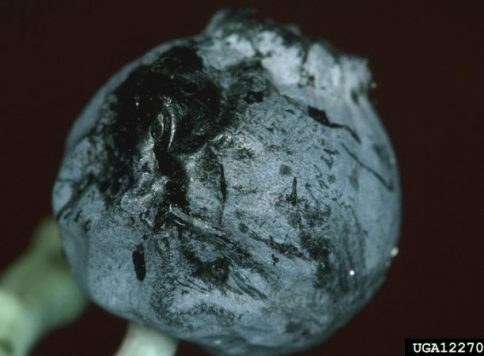 This seems to increase occurrence of fruit damage. Eggs… (Approx. 7 Days) Laid singly inside fruit by female. 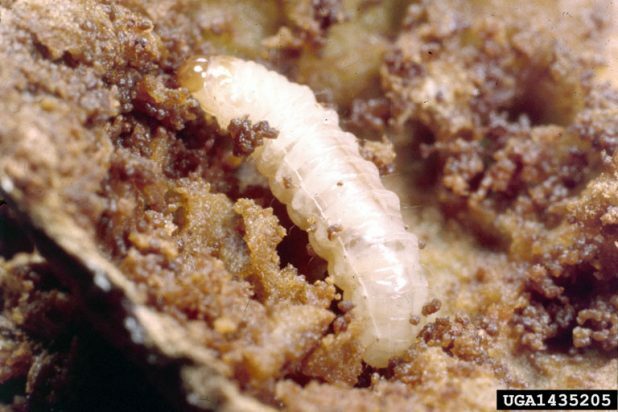 Larva… (10-16 days) Massive destruction caused by eating behavior. Develops inside protection of fruiting structures. 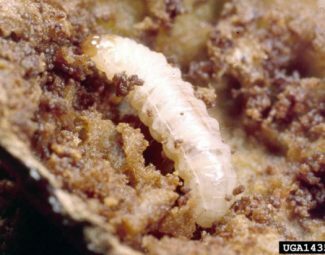 Burrows out of fruit by making an oval exit hole and drops to the ground and burrows to pupate. Yellow-white in color with brown head. Legless and grub-like. Pupa… (4-5 Weeks) Develops in self-created small cell approx. 1-3 in. deep in soil. Translucent white in appearance. 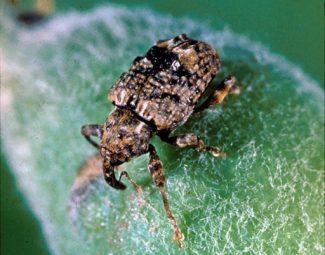 Adult… (4-5 Weeks) Small, brownish-black beetle with small, curved snout extending from the head that is used for making punctures to feed and lay eggs. There are 4 distinguishing black bumps on its back. Approx. 6 mm. in length. Female can lay 60-150 eggs in lifetime and begins when fruit reaches adequate size to support larval development. Deploy Tedders traps (see here and here) with black stands around perimeter of orchard to monitor immigration of diapausing weevils. To monitor populations inside field use either: 1)Screen traps mounted to tree trunks or, 2)Tedders traps with black stands located underneath shade of tree. Use these traps to monitor infestations and to make decisions on supplemental controls. Neither method has been proven to give direct correlation to infestation(2010), but should be used with other monitoring techniques. Adults enter period of decreased activity and metabolism in late summer/early fall, seeking out dense brushy areas, garbage piles, and other insulating environments. Live off stored fat reserves located under wings. Mean temperature between 55 and 60 degree F for three to four days. Mean temperature above 60 degrees F for several (three) days. Maximum temperature of 75 degrees F for two consecutive days. Peak emergence typically occurs within 14 days after petal fall. 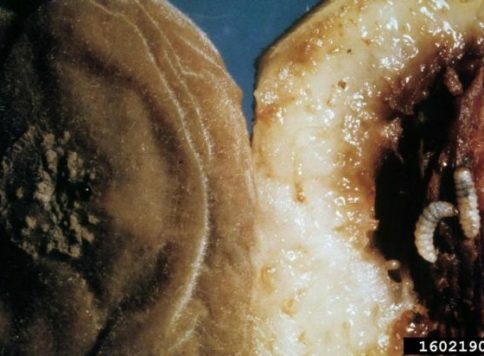 The beneficial nematode Steinernema riobravis has been shown to suppress curculio populations by 78-100%. This species is native to Texas and is commercially available for augmentative release. Monitor wild host trees surrounding the grove and eliminate or treat if possible. Continuous disposal of fallen fruit throughout the season and after harvest. Tie tightly in plastic bag and haul to away to land fill. Use pigs or other animals to consume fallen fruits and pits after harvest. Clean up and dispose of any garbage piles, brush, leaf litter and other rubbish that may serve as overwintering sites. Lalancette, N., Belding, R. D., Shearer, P. W., Frecon, J. L., Tietjen, W. H. Evaluation of hydrophobic and hydrophilic kaolin particle films for peach crop, arthropod and disease management. Department of Plant Biology and Pathology, Rutgers University, Agricultural Research and Extension Center, Bridgeton, NJ 08302, USA. Prokapy, Ronald; Wright, Starker; Positioning Unbaited Pyramid Traps to Capture Plum Curculios. Department of Entomology, Univ. of Mass. 1997.F. J. Eller and R. J. Bartelt. Grandisoic Acid, a Male-Produced Aggregation Pheromone of the Plum Curculio, Conotrachelus nenuphar 59 (4), 451 -453, Bioactive Constituents Research Unit, National Center for Agricultural Utilization Research, USDA/ARS/MWA, 1815 North University Street, Peoria, Illinois 61604. 1996.